When I travel, I hate to scrimp on my products just to abide by the measly luggage allowance that the airlines like to enforce. Holidays are a time for me to enjoy my products and focus on pampering myself so that I come back feeling very refreshed and perfected so I like to take smaller sizes of my favourite, luxurious feeling products with me. That way, I can indulge and pamper my body without having to take an extra suitcase along for the journey. One of my favourite body brands has to be Weleda; I’ve been using their products for years and years. 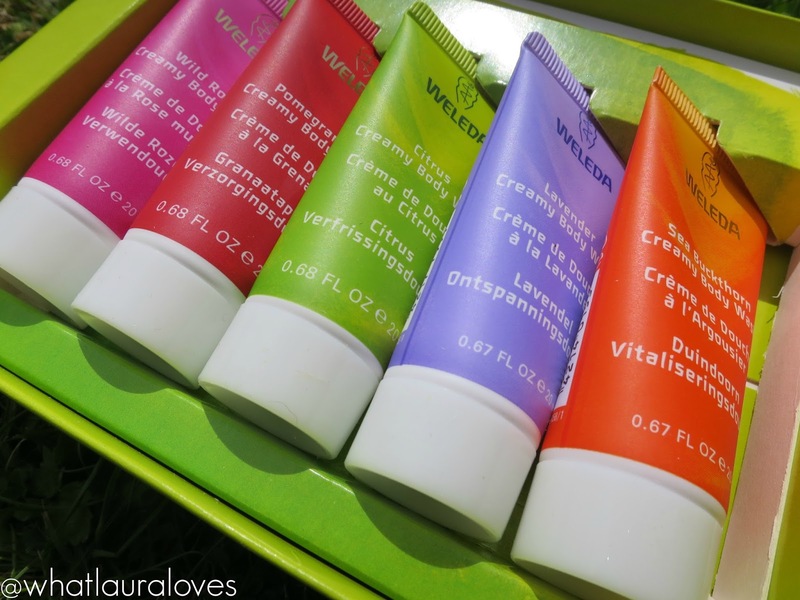 They have such a fantastic range in an abundance of fragrances that there is something for everyone but the best thing about Weleda is that they make their products in travel sizes too. This is perfect for people like me who often go on holiday and like to take their favourite products with them when they travel. 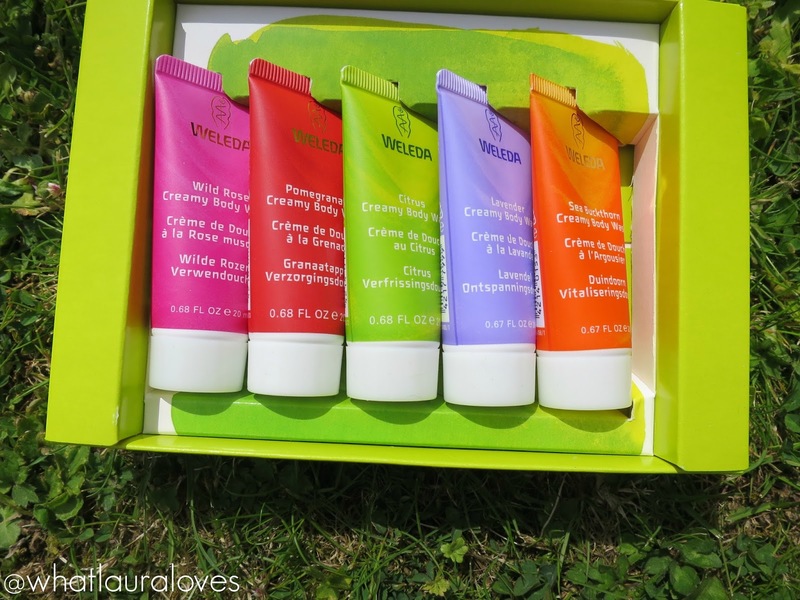 Weleda have just launched a little rainbow coloured travel pack that contains five miniatures of their vegan friendly creamy body washes. These mini sizes are ideal for holidays, weekends away and short trips as you get about 3 uses out of each 20ml tube, at least I do. The five minis in this set come in colourful tubes with screw lids and they each have a different fragrance which are designed to awaken and refresh you first thing on a morning or calm and soothe your body and soul at the end of a long day. There are so many shower products on the market but what sets the Weleda Body Washes apart from the others is that they have a super nourishing formula that is very kind to the skin and wont upset the skins natural pH balance. Each of the Weleda Creamy Body Washes contains organic oils that help to leave the skin feeling soft and smooth. These pure essential oils help to naturally fragrance the body washes without leaving them with a synthetic, artificial scent. They also help to preserve the product naturally which means that Weleda don’t need to add any artificial additives or parabens to keep it fresh, which is much more gentle on the skin. My favourite fragrance to use in a hot climate has to be the Citrus Creamy Body Wash. It has such an invigorating and refreshing scent that is perfect for using in a morning shower. Citrus scented products are great for keeping mosquitos at bay so this is a good option to use abroad with your evening shower before heading out into the night. The most relaxing and soothing of the bunch has to be the Lavender Creamy Body Wash. This one is perfect for using at night before heading to bed as the strong scent is so calming and it really is in tune with my senses to help me to chill out. The Wild Rose Creamy Body Wash is another that has a similar effect on me. It is made with organic rose oil that is cold pressed from wild rose hips that are rich in essential fatty acids and vitamins A, B and E which really help to nourish the skin. It feels like such a pampering treat to use and feels really indulgent and calming at the same time. I never used to enjoy rose scents but as I get older, I have found that the floral notes appeal to me much more than they did in previous years and I actually appreciate the lingering scent on my skin. All of the Weleda body washes feel really luxurious to use because they’re thick and creamy and very indulgent; they really set themselves apart from the other shower gel/cream products available. The scent of each one just adds a little something extra to my shower and I love the way they’re strongly scented enough to linger on the skin but they’re not overpowering at all. My favourite of the bunch to use at home is the Pomegranate Creamy Body Wash which has a delightfully fruity scent. I have purchased many different Weleda products that have the pomegranate fragrance and really enjoyed using them all because I love the naturally fruity scent that it has. Often fruit fragranced products smell really artificial but this one is authentic and natural. If you’re off on holiday or taking a trip somewhere then I’d really recommend picking up this set of shower minis because they’re an ideal size and wont take up much room at all in your wash bag. They’re also a great way of trying out a new scented product without committing to the full size so that you can see which fragrance you like and whether the product works well for you. I’m sure they will as they not only clean the body but leaving it feeling soft thanks to the moisturising, creamy formula. I can’t envisage anyone not enjoying using these, it just comes down to personal preference as to which fragrance you like the most. The only one that I don’t really like from the set is the Sea Buckthorn Creamy Body Wash. I’ve tried this one before and its a bit of an unusual one; sometimes I like it, sometimes I dont. It smells very revitalising and has a zesty, orange and grapefruit scent. Very unusual but not quite for me, I don’t think. I’ve still used it though and like the others, it has cleansed and moisturised my body effectively. I find that these body washes don’t lather up dramatically as such, instead they remain creamy and feel very luxurious on the skin. Standard shower gels tend to have foaming agents in them that help to remove dirt particles but in doing so, they can harm the environment too whereas Weleda body washes have natural cleansing agents that are particularly mild. They’re made from sugar and coconut, are quickly and entirely biodegradable and ecologically sound, even for aquatic life. This makes them ideal to use even on campsite locations such as glamping trips and festivals that often have soak-away drainage systems. The Weleda Body Wash set is available from selected independent health stores and online here. The full sizes are also available individually from Feel Unique and Look Fantastic. Previous Post Summer Festival Secrets with River Island! These look great. I've not actually heard of Weleda before or seen any products. I'll have to check them out now.